FIELDS ARE LIMITED — REGISTER IN ADVANCE TO ENSURE A SPOT! Online Registration is available at bikereg.com. Pre-registration closes on Friday, June 15 at 5:00 PM. No mail-in registration and no refunds. Children under 18, with an adult teammate. Each team member does one half of a lap. * Price does not include a separate fee that BikeReg charges to register online. ALL ENTRY FEES INCLUDE A TICKET FOR A FOOD AND DRINK. Course is trail/loop around park and consists of of a main loop of smooth, nicely flowing singletrack with plenty of banked turns. There is an inner loop trail that is geared toward the technical rider with a handful of interesting skinnies and jumps. Final course subject to changes prior to event. No amplified speakers or loud music. 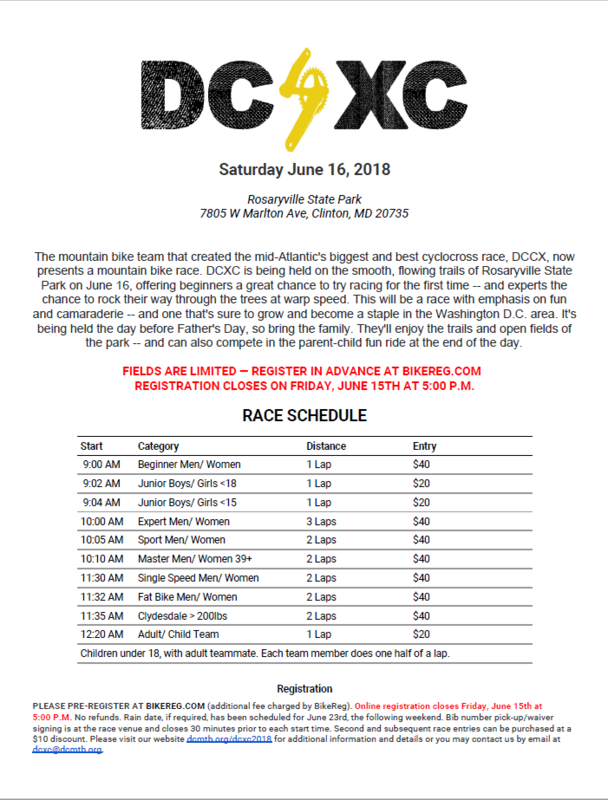 Event Parking: PLEASE NOTE THAT THERE IS A $3 ($5 out of state) ENTRY FEE INTO ROSARYVILLE STATE PARK USING THE HONOR SYSTEM – PLEASE BE GOOD BIKERS AND PAY YOUR FEE SO WE CAN KEEP THIS RACE GOING. THIS FEE IS NOT INCLUDED IN REGISTRATION FEE. PLEASE OBSERVE ALL SPEEDS LIMITS AND PARK ONLY IN DESIGNATED PARKING AREAS.